Since then, its uses have become more targeted, and it’s one of the leading therapies for sunburn which is a testimony to its soothing abilities. It is a commonly known fact that Aloe leaves contain a clear gel that can be used straight from the plant when a leaf is broken off from the rest of the plant, this gel can be applied topically to heal wounds and soothe burnt or irritated skin. Many research studies have been undertaken to determine the benefits of the aloe vera plant. These studies concluded that Aloe Vera does have several properties that are wonderful in easing a variety of skin conditions, from flaky or dry skin, cosmetic irritations, hair and scalp problems to many more minor advantages to numerous to mention. 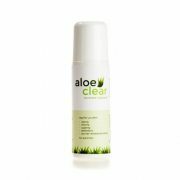 At Aloeclear we take dried Aloe vera powder and rehydrate it to create an Aloe rich liquid. This is then used instead of some alcohol as a carrier liquid meaning we moisturize more and sting much less than our competitor’s brands. Whilst Aloeclear contains many other ingredients such as salicylic acid, glycolic acid and mentha piperita, we love the difference that Aloe Vera brings to our range. If you want to try Aloeclear why not purchase one of our trial sizes Shave saver or Bikini saver? They contain enough product to try for yourself for 7 days and only cost £2.95! !